Why 'store... !csvLine' inserts double quotes no matter what? 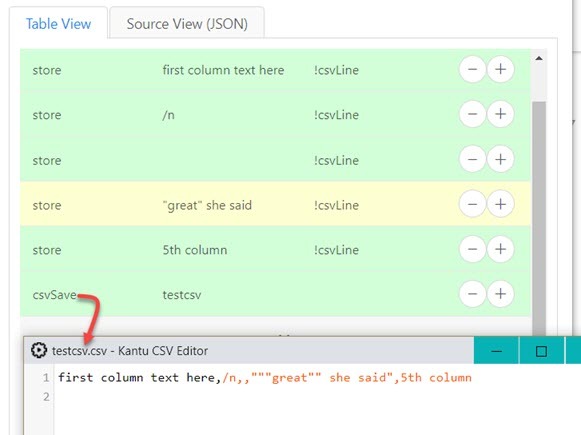 - Kantu - Forum for Kantu Task and Test Automation and the free OCR API. Why 'store... !csvLine' inserts double quotes no matter what? When I try to store my string in always inserts double quotes ("). Even if I put single quotes or even double quotes it does it anyways. But storeText has no such problem. It stores the exact piece from the DOM. storeEval might give me the result i need, BUT if there is a slash" or " in the line its done… more " on both sides of the full line. Ok, now I understand. It seems the !csvLine documentation was not very clear about this. When pushing data into !csvLine, you need to store every value separately. Because once csvSave is called, every value that is stored in the !csvLine internal array will get wrapped with “…” automatically (if needed) before saving. This does not make any more sense to it. Who defines the “need” for that? Even if you try so save empty line with “” it will double wrap it again “”""". Is there a need? I doubt that. Try saving next line (\n). In your example /n is not next line. This wraps it up in “” which is a total disaster. And if there is a need for that it is completely messed up my friend. You cannot start a next line without double quotes. This puts HUGE restrictions on working with csv file. If this cannot be fixed how do I store data to file directly without middle array that messes up the output? It works fine with\n as well. It gets sourrend by “” as per the CSV file format definition. I guess I do not understand your goal correctly: Do you actually want to save a CSV file, or do you want to create some other file format? The goal is to use special characters. I need to break the line which I do by saving file every-time I need to, but this is a workaround. I should have just use \n. But I cannot store \" it does wrap whole line with doublequotes which makes everything useless. Definitely there should not be mandatory doublequotes wrap. If everything is messed up because of my mistake not putting quotes this is one thing. But if I cannot do certain things because somebody decided to help and wrap a text for me with quotes this is another. I’m not sure if I explain correctly. Sorry about that. Can you see why double quotes are a problem?